Working for clients across London and the rest of the UK, we specialise in the provision of first class, trusted and respected IPAF training courses. As an officially registered IPAF training centre, we offer fully approved and accredited training courses perfect for you and your employees. In fact, the standards we set are accepted everywhere across London and the UK. When you're trained by us, the Powered Access Licence you receive will carry real weight wherever you go. So book your place on one of our courses today! Visit our 24/7 booking section and course selector, fill out your details and then select your place on any one of our trusted and accredited training courses today. Our IPAF qualified instructors know exactly how to get the best out of any machine safely; which means that you and your employees will too. In fact, we stand by our statement that training will enhance motivation and performance of individuals and help your business to achieve your objectives. Our IPAF training course content, training premises and instructors have all been subjected and passed a rigorous assessment to ensure full compliance with IPAF quality standards. In addition, we are also subject to an ongoing audit regime conducted by IPAF auditors themselves to ensure that we continue to meet, and even exceed, the high standards they demand. For your peace of mind, our IPAF training courses are also certified by TUV as conforming with ISO 18878 : 2004. 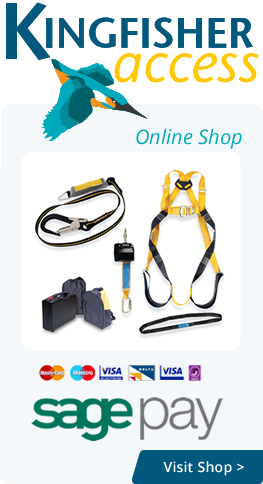 Aside from comprehensive training on how to effectively and safely use powered access and other working at height equipment, you'll also receive an IPAF approved Powered Access Licence Card (as shown to the right). Our IPAF harness training courses are available as regularly scheduled Open Courses making it easy to plan and book your training at our London training centre. So contact us today to discuss your requirements, or visit our 24/7 booking form to select your IPAF training course and book your place.